Home News SPARK Support LIVE! Attend an open office hours LIVE work session with PaILS’s Director of Technology and System Support, Lugene. Tuesday, April 16 from 2p.m. to 4p.m. Don’t worry if you miss this week, in future weeks, we’ll have different hours to serve library staff who work varying hours around the Commonwealth. Format: This is a trial for a new way to offer immediate support. We’ll take questions one at a time. We can’t guarantee answers, but we’ll do our best to work through your problems. This session, or portions of it, may be recorded. The live “Help Desk” support hours demonstrate our commitment to customer service. Just drop in and talk to us directly either about an open ticket you have or about a new situation. Be at your computer and we can enable screen sharing to walk through the situation together. Expect to share your screen to demonstrate your failure or success with something you are trying to do in our SPARK Evergreen installation. Lugene and the community will work on it together, live. Come with a problem, come with a solution, or just come to watch and learn from Lugene and others in the community how they use SPARK. Problem solvers should feel free to attend these hours to offer help if it matches their schedule. Intended Audience: In the first few weeks, this SPARK Support Live is recommended for SPARK community members that have a LibAdmin, Tech Services, Circulation Supervisor permission level. In future weeks we may offer hours targeted for people with specific permission levels or on specific topics. A post and the link to this live meeting will also be shared on the Users Mailing list. 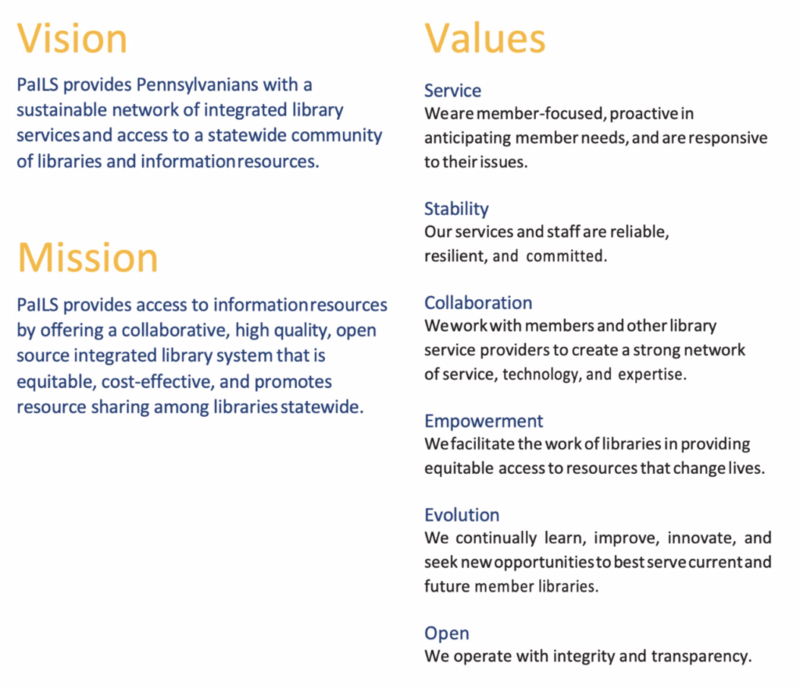 Service is first in the list of Pennsylvania Integrated Library System’s values, closely followed by Stability, Collaboration, Empowerment, Evolution, and Open.